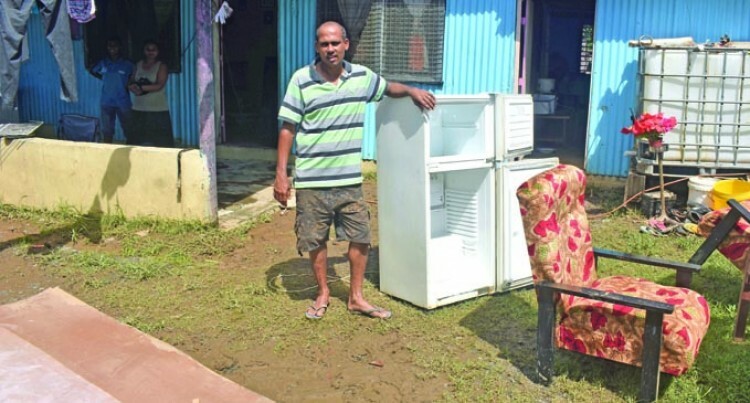 Years of hard work and sacrifice went down the drain for Rakesh Mani after floodwaters destroyed his family home in Nawaji Kuma Settlement in Nawaka, Nadi, over the weekend. “I was attending a relative’s wedding in Ba when I heard over the radio that a tropical cyclone was approaching Fiji it was on Saturday, but we couldn’t come to Nadi because all the roads were blocked so we had to stay till Monday,” Mr Mani said. A neighbour, he said had told him that flood waters had entered his two-bedroom home. The father-of-three has been staying with his family in the settlement for the past 10 years. “From that moment, I knew that all my house items and electric appliances will be destroyed, by the time we reached home on Monday morning, we saw all the items on the floor in a pool of mud left by floodwaters,” Mr Mani said. His taxi was also damaged, which was a source of income and would earn at least $150 a week. “All the electric appliances were damaged, I just bought two new sets of TV, two fridges. A queen size bed, dining tables and other electric appliances were among items damaged. It took me a decade to get all these things but now I have to start from scratch,” Mr Mani said with tears.